Your wedding is a once in a lifetime event, a day that will live forever in your memory. A DVD of your wedding ceremony and reception will bring back all the excitement of your special day. Hopefully your children and grandchildren will be able to view your wedding on your 25th, or even 50th anniversary. Because weddings take place in difficult lighting situations without opportunities for retakes, wedding videography is one of the most difficult types of videography. Also, there are many restrictions are placed on the videographer in terms of where the camera can be positioned at the church or wedding site. Most beginners do not have the skills or equipment to achieve even moderate quality wedding footage. The result is a video with an out of focus, far away picture, and barely audible sound. 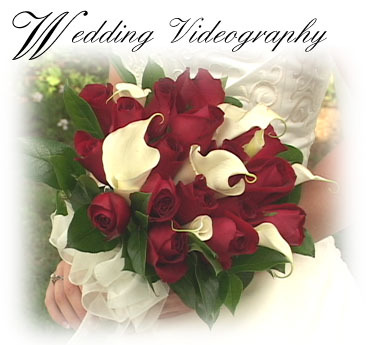 Tim Kossler has over 20 years experience in wedding videography. He has developed many techniques over the years to create extremely high quality wedding videos. Finally, professional editing with sound mixing is what makes a wedding video truly enjoyable to watch. For these reasons alone most people feel that the cost of a professional is well worth the money. What else makes VideoEvents.com an outstanding video company? We produce all our videos on DVD, for no extra cost! Our DVD's have chapters so you can skip around and watch the part of the video you want to watch. Our DVD's are Dolby® Encoded. We use all professional cameras, sound, and editing	equipment. We listen to our clients and customize the video to suit their needs. We pay attention to little details which personalize your video. No hidden costs! We include everything in one package price, and you select the package you like best.